The fast movement of water through the confines of the Swellies means we can find a number of waves here to surf. There are surfable waves on both the flood and the ebb. While you won’t find the world’s largest waves here, they range from 1ft to around 4ft at times, there is still enough variety and challenge to entertain. All the waves have different characteristics, and while some work well for short boats (slalom boats and playboats) there is also plenty of sport to be had for longer boats. 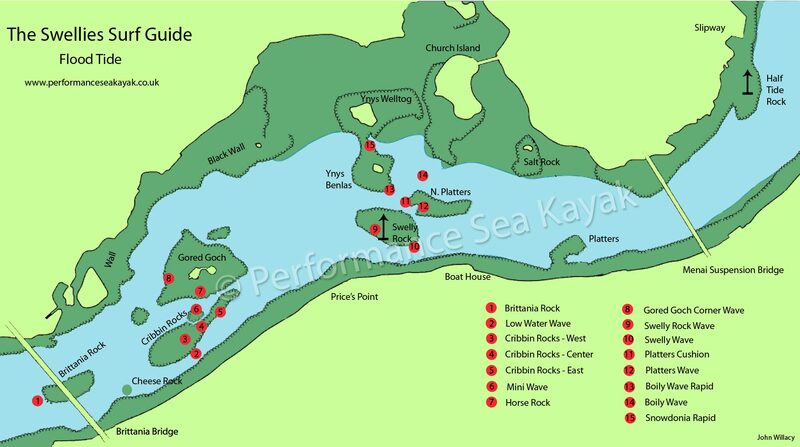 This guide is written with sea kayakers in mind. 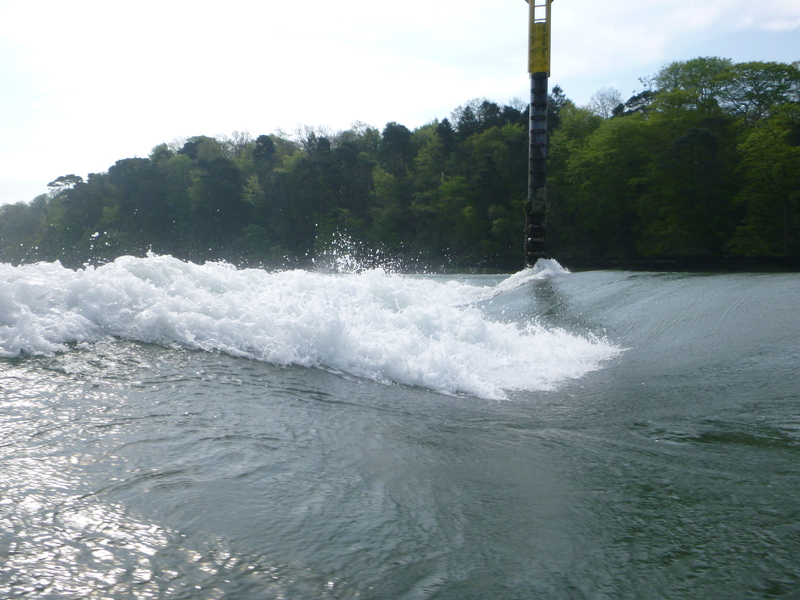 The nature of the Swellies as a narrow tidal channel means that the flow rate and water depth are constantly changing. This in turn means that the waves are also evolving throughout; they will form, grow and wash out, rocks will cover, the power of the water will come and go and new waves will come ‘on-line’. Whatever wave you have, the one thing you can rely on is that it will change, and probably fairly soon. If your wave is not there, hang around for a few minutes, it may form again… On the other hand, never squander a good wave – it’s only going to get smaller! The waves on the flood tend to be longer lasting and a little more forgiving than those on the ebb. While waves form on both neaps and springs, there is much less surfing sport to be found on neap tides. 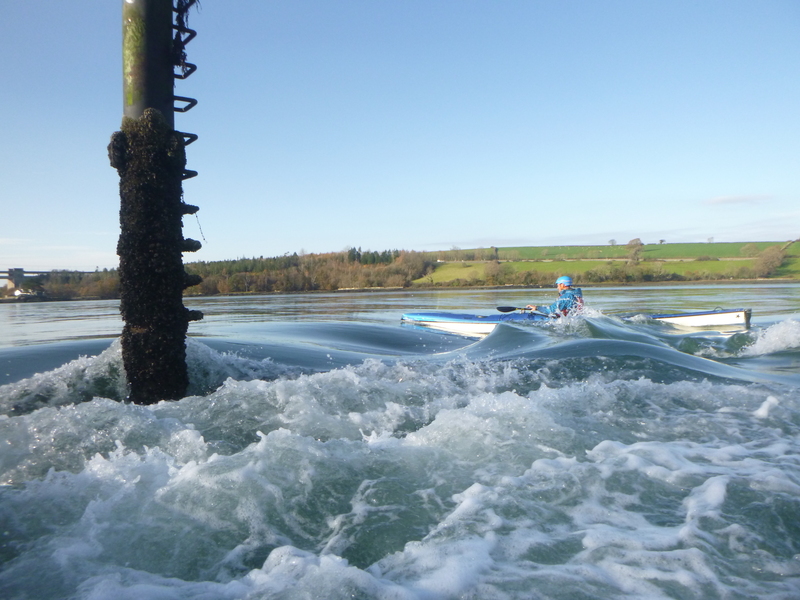 From the start to the end of your time on the water, conditions will vary greatly here, providing a wide opportunity for learning, challenge and fun. Enjoy! All watersports carry an element of risk; this risk is magnified on moving water. Standing waves are formed as moving water is deflected by sub-surface obstacles, these obstacles are often close to the surface and are obvious hazards. The Swellies is an active sailing channel too, with craft of all shapes and sizes transiting – including regular high-speed ribs. Be aware and keep out of the way. Other hazards include: posts, buoys, moored craft, submerged and low-hanging trees, rocks (plenty of), fish traps etc. It goes without saying that helmets and buoyancy aids should be worn. Carry the relevant safety kit, including a method to raise the alarm. Know your limits: we need to be frank and honest in our abilities and make sure we are safely capable of what we are attempting. Avoid paddling alone. This guide provides nothing more than a few locations where you may find waves to try, and a few ideas on what to expect. IT IS NOT A SAFETY GUIDE TO PADDLING THE SWELLIES. It cannot cover all eventualities and does not aim to provide a detailed explanation. 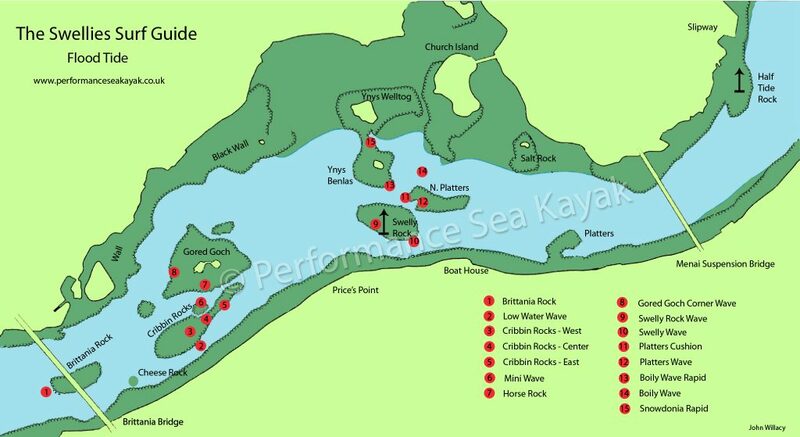 Do your homework before paddling. The flow rates within the Swellies oscillate at a micro level within the tide cycle. That is, the speed of flow increases and decreases over a short, regular cycle (timed in minutes). This is apparent on both the flood and the ebb; the effects are significant on the flood, though barely noticeable on the ebb. This ‘surge’ affects the flood waves greatly, taking some waves from full height down to barely a ripple and then back again – over a matter of minutes. 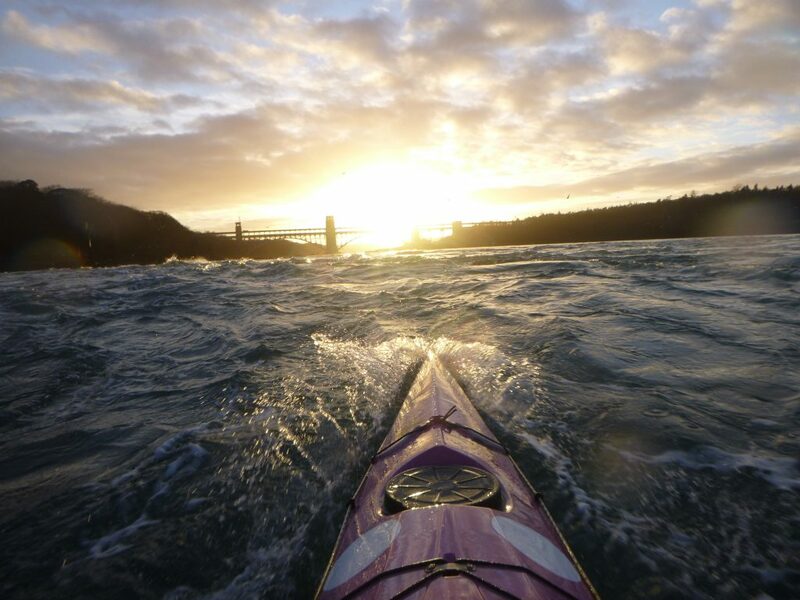 Not only is it an intriguing and impressive phenomenon, as paddlers we can also make use of it to allow us easier access onto some of the waves. N = North, S = South etc. LH/RH descriptions are given as if sitting on the wave i.e facing upstream. ‘Feeds’ – a sideways displacement along the wave. Height figures give anticipated largest wave heights – these are approximate and will vary day-to-day. Description: A very small wave forms on the Bangor corner of the upstream edge of Brittania Rock on the flood. Later there may be a mirror-image wave on the Anglesey corner also – however this is a little more rocky and less defined. These waves are surfable at times, the Bangor one more so. However they are very small and not really worth the effort; I have included them here for no more than ‘to-complete-the-picture’ really. 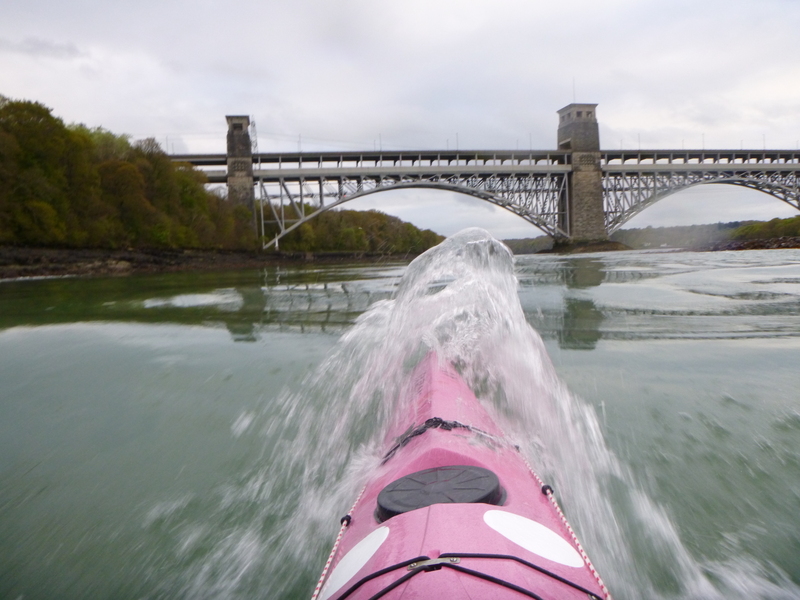 If you are paddling up from Menai Bridge, every wave you’ve paddled by is better. Save your energy. Runs from: LW to mid-flood. Good For: Both waves have an eddy. 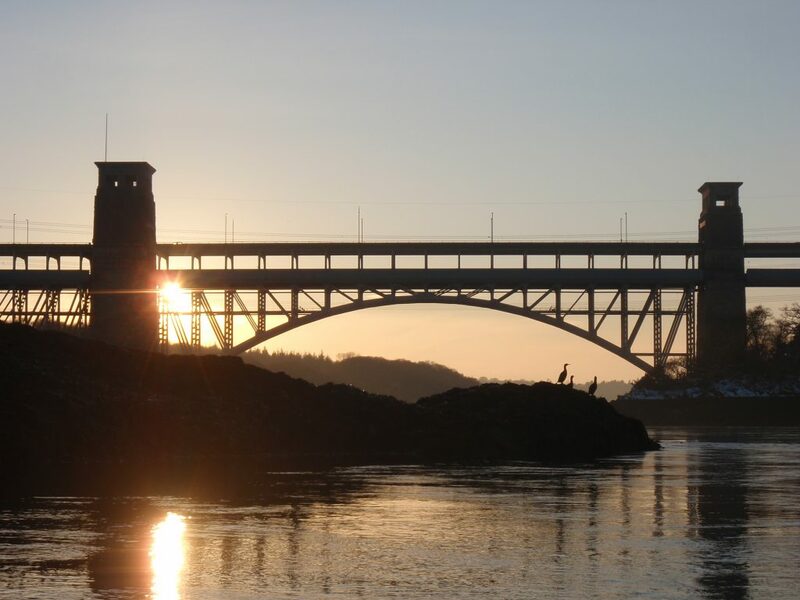 Location: About 300m downstream of Brittania Bridge, in the Main (Bangor) Channel – towards the upstream end of Cribbin Rocks. Description: This wave is a little gem. A nice, green wave that doesn’t really dump or break. It stretches out from the Bangor shore to about 2/3rd the way across the channel, to give a fast and smooth ride. However it is relatively rare; it only runs around LW and needs a decent spring tide. The bigger the tide the bigger the wave. On faster flows a useable second wave forms just behind. At LW on the biggest tides the water moves fast here. Runs from: Close before LW to a little after. It washes out early, before mid-tide. Good For: An easy, fast surf. Bad For: The eddy (on the Bangor shore) is small and scruffy. I like…it for the 30 minute surf I’ve had there. Location: Upstream end of the Cribbin Rocks reef. Description: A small 1-1 ½ ft wave that forms as the water runs over the end of the reef. It is rocky early on but produces a surfable wave, extending parallel to the reef, a little later. 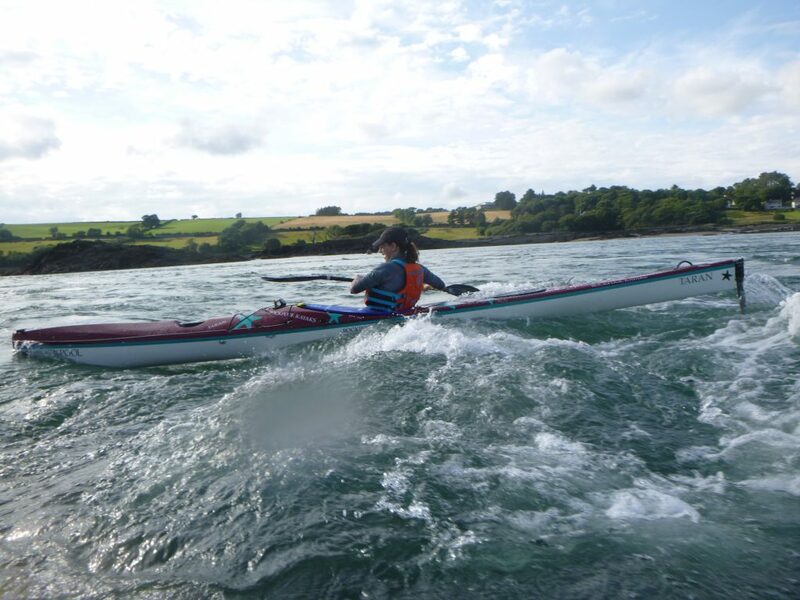 As a short wavelength wave it perhaps surfs better in a slalom boat, but still works for a sea kayak. A small stopper/white wave forms on the RHS – it goes green as you move a little further out. There is plenty of space in the eddy below and to the side; however flow in the eddy can make positioning for the wave a little clumsy. While the boily confluence of flows below the wave can make for a slightly tricky spot at times. Good For: Easy surf practice. Bad For: The boily eddy line just below can make rolling tricky. I like… it as a warm-up. Location: Center section of Cribbin Rocks reef. Description: A small, narrow and steepish wave, formed as the water runs through a gap in the center section of the reef. Early tide it is rocky and confined, less than 2m wide. As the level rises and rocks cover, the wave widens and flattens out a little. Early on there is not really enough room for long-term sea kayak interest, but things get a little better late on. The early wave does give a gentle challenge for the slalom paddler working on bow control. There is a roomy eddy below and to the LHS. Runs from: Close after LW to mid-flood – forms and fades a little later than the Cribbin West wave. Good For: Precision practice early tide. I like… it gives a variety of interest when linked with the other Cribbin waves. Location: Downstream end of Cribbin Rocks reef. Description: Another small wave that forms as the flow runs over a slight drop at the downstream end of the reef. Mostly it is just over a boat length wide. Like the west wave it is green for much of its length but forms a small stopper on the RHS – this can give a gentle hold at certain levels. 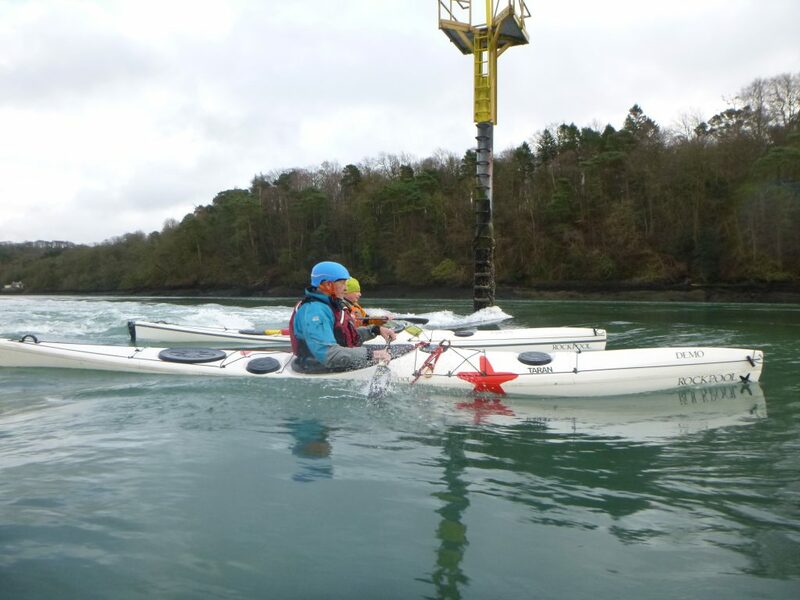 It is quite a short wavelength wave so sea kayaks may find their bow close to the barely-hidden, sub-surface rocks. 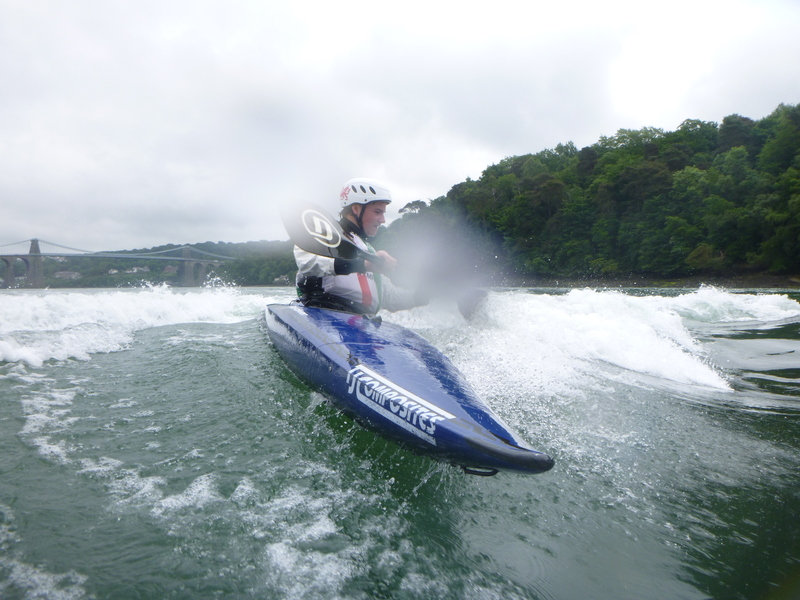 It works well in slalom boats, where it gives a good exercise in (short) upstream-blade crosses. However an upstream flip will be barnacle rocky. Very late in the tide (on Springs) the rock pinnacle (on the RHS) finally covers to form a V and then a small, dumpy wave that surfs somewhat. Runs from: After LW to mid-flood (late flood for the Pinnacle wave) – forms and fades a little later than the other Cribbin waves. Runs best when the other two Cribbin waves are washing out. Good For: A little more dynamic than the other Cribbin waves. A small but useful exercise in upstream-blade crosses. Bad For: Bow rocky and a little ‘short’ at times. I like… it for off-side surfs in the C1. Location: Mid-channel, roughly half-way and slightly upstream of the line between Cribbin centre-gap and Horse Rock (Gored Goch). Description: A small wave formed by a close sub-surface rock. Mini Wave is narrow with a slight reverse horseshoe to it, this feeds quite strongly on the outer edges. The wave also has a lazy dump to it, while the rock forms a scruffy eddy a couple of metres downstream that never quite meets up with the wave. On neaps the whole affair is gentle, but surfable – though at times you wonder if it can really be bothered. It’s ok for a bimbly surf on a sunny day. On springs things become faster and a little more demanding, and now the dump can make things a little wet. It’s never a big, steady surf, though it’s worth a go for the practice. It also makes a good aim point/mini-sanctuary for crosses between GG and Cribbin. Runs from: After LW to mid-tide or so, depending on neaps/springs. There’s only a wave once the rock is covered. Good For: Gentle surf on neaps and a bit more of a technical challenge on springs. Bad For: It never really gets going – don’t get too excited. I like… it for a bit of technical practice. Location: Just below the upstream end of Gored Goch island, on the Bangor side – about 30m upstream of the fish trap wall. Description: A car sized rock, a few metres out from Gored Goch, is the cause of this wave. Early on the rock is dry. As depth and flow increase, the water splits and drops away from the upstream end of the island to flow over a 2-3ft drop early on. This forms small and narrow, offset waves that later join to form a broken horse-shoe wave. Later, as the level fills it becomes a smooth and gentle surf on neaps. While on springs a fast, lumpy and slightly broken wave forms. Faster, more dynamic surfing on bigger springs. This wave is constantly changing throughout the flood, and can seem inconsistent from day to day. Runs from: After LW to late tide, depending on neaps/springs. Good For: OK surf at higher flows but can be hit and miss on getting the timing. Bad For: Rocky and ill-defined at early stages. Can be dumpy and unhelpful later, on larger springs. Location: Upstream end of Gored Goch on the Anglesey side. Description: As the flow splits at the top of the island it finds itself pushed out and around a rocky section. This forms a small drop as the water runs over an uneven ledge, creating a small, diagonal wave which runs roughly parallel to the main flow. The LHS of the wave is often white, turning to green as you move further out. The wave is always slightly broken and staggered. It is a narrow wave that never takes you far from the rocks. The angle means that as you surf along the wave you are actually moving a little upstream too. Diagonally out and slightly upstream of the end of the wave is a small flat second wave that can be linked to, in order to climb the rapid. Early on the wave is little more than a gradient with a ripple , later on the wave becomes more defined but the flow becomes faster too. The wave is always a little awkward and unhelpful; it never really makes for a relaxing surf but gives a technical challenge. On springs it can be quite fast here and the wave is surfable it can be a little unhelpful. On neaps things are much more accommodating. Though it’s only a very small wave (<1ft) on neaps, there is a gentle surf just to the RH end of the wave. Runs from: Through to after mid-flood. Good For: Practicing an awkward surf on a broken, angled wave. Bad For: Clumsy and awkward much of the time. If you go in upstream, then rocks, blade, body and bonce are likely to become closely acquainted. I like… it as a way to climb around the top of the island. NOTE: If you are climbing this section later in the tide be aware of the vents in the fish trap wall. These form a hazard even when covered – stay clear. Location: On Swelly Rock, immediately to the N side of the Cardinal post. 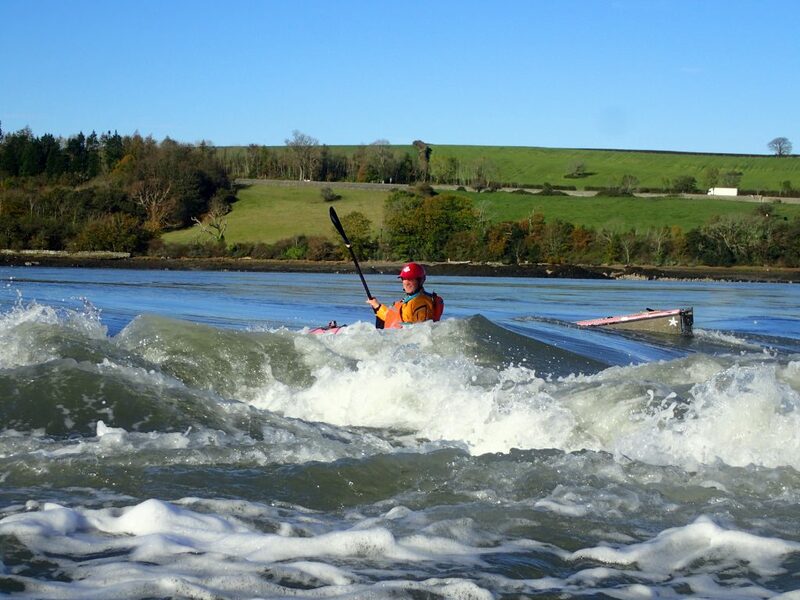 Description: Along with the Swelly Wave (Main Channel Wave) this is the more popular and better surfing of the waves in the Swellies. It is usable on anything other than gentle neaps, giving a variety of conditions and different characteristics throughout the tide and the neap/spring cycle. Starting off as little more than a rocky pour-over, this wave progresses into a small steep wave, through a flat surfing stage, and later into a larger green wave, with a breaking shoulder. On bigger tides, a holding hole will form on the LHS too. The wave you get is very dependent on the strength of the tide and timing within that tide. Early stages and the rock causes a steep and narrow, dumpy lump a couple of metres out from the post. This always feeds quickly either way and needs constant input to stay on – it can be a bit of a pain. Later this lump forms the breaking part of the wave. Move another metre or so out and you will find smooth, green peace and quiet(ish). On the biggest tides the characteristics change somewhat; everything becomes louder, faster and more powerful. Early on there may be a significant pour-over that forms an intimidating and unpleasant hole. Avoid. Later this will wash through as a surfable wave comes on line , to give the larger wave of the Swellies. It breaks on the LHS and goes green as you move further out – with a good shoulder between. 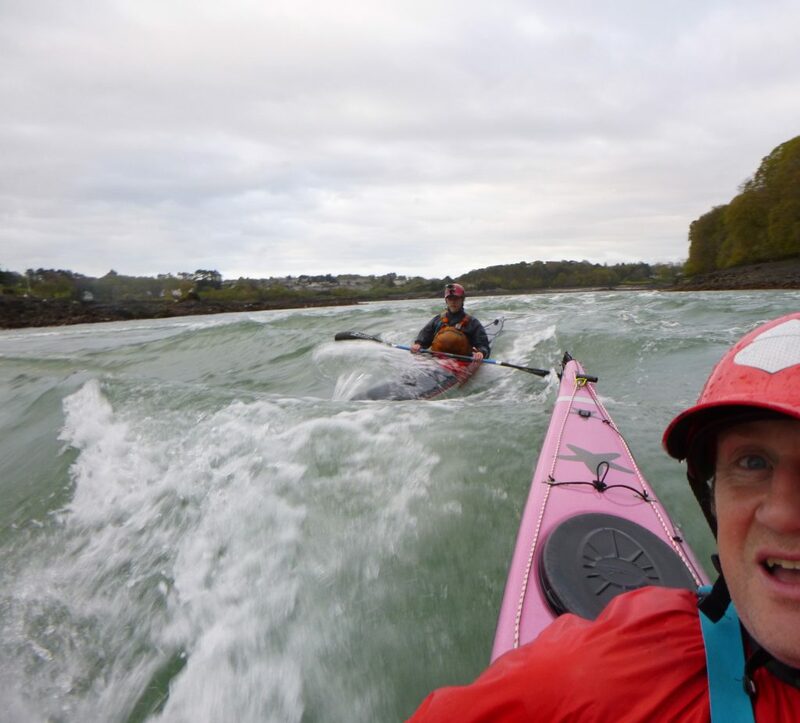 Late in the tide, especially on springs, it can become a challenge to get onto the wave, as the eddy washes out – it becomes smaller and much boilier at the top end. Wait and watch the wave for the fade. When the noise level starts to increase this is an indication that the wave is about to reform – paddle out to where the wave is going to be – about 3m out from the post. Hold position precisely there and wait for the wave to build beneath you. Now surf. Sneaky. Stay high up the eddy – daydream and you will find you have a long, tedious paddle back up – missing surf opportunities on the way. On springs the wave will eventually start to wash-out. As the wave fades, a V-wave starts to form off the Cardinal post – treat as per surfing ‘The Cardinal – On the Ebb ‘. 10-15m from the end of the wave and slightly upstream is an extended wave at times. This is small and flatter but surfable – if you can link the two. A good exercise. A good W/SW wind pushing behind a large spring tide makes for impressive flow here. Though on the whole I think the best surfs may be on just below-biggest springs. Height: 1-3ft+ Maybe just about 4ft now and then. Runs from: Usable from an hour or two after LW; best surfing comes online once the Cardinal ‘plinth’ starts to cover. Good For: A nice variety of year-round surf. I like… it as an old friend . NOTE: PIN HAZARD – AVOID APPROACHING FROM ABOVE. DO NOT allow your bow to move above the post at any time. Danger – Stay below. While this is a regular surf spot, there is a significant chance of pinning/entrapment at times if even part of your boat is upstream of the post – with a likely fatal outcome. The wave can always be gained from below – there is no need to drop down onto the wave. Be aware that later on the wave moves level with the post. A surf of the Swelly Rock on a 10.0m tide (previously published as 'Swelly Surf' – this version added for inclusion in the Swelly Surf guide). 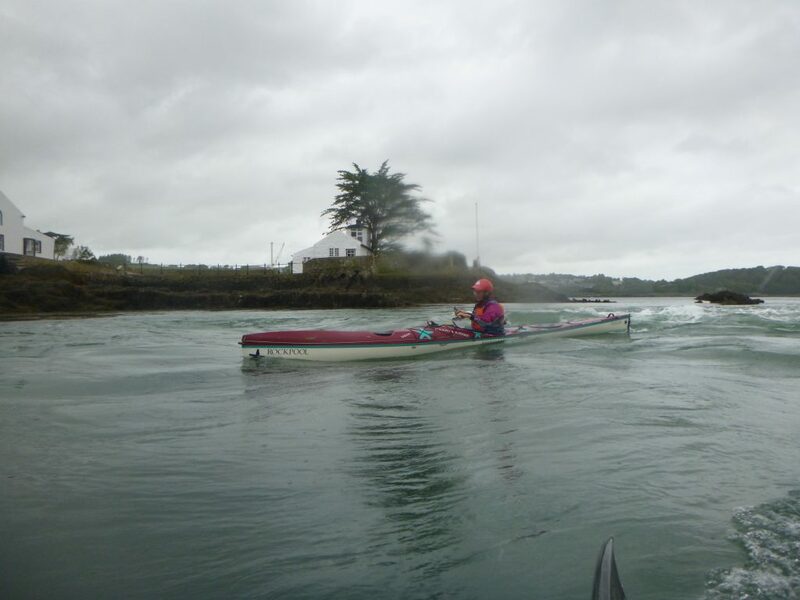 Location: In the main channel downstream (Bangor side) of Swelly Rock. Description: The classic Swelly Wave. 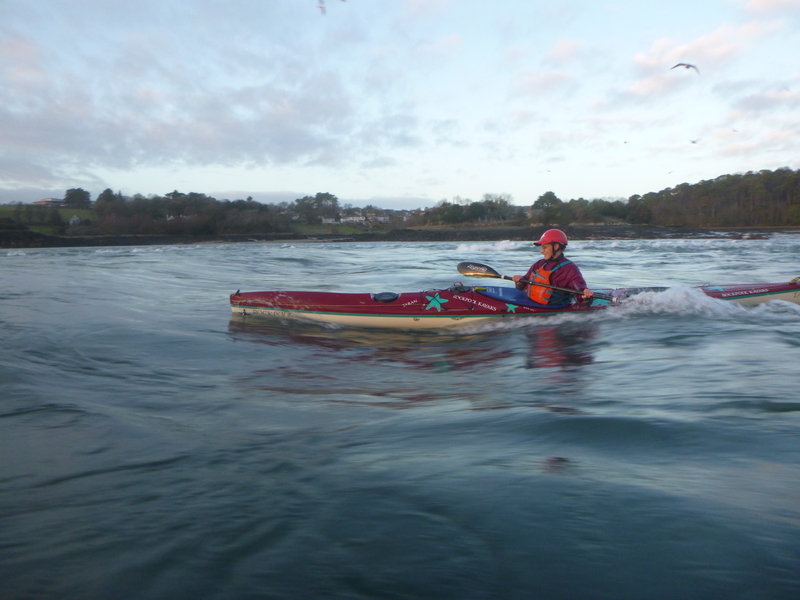 This wave forms on the Anglesey side of the main channel from close before LW. The wave sits on the edge of the large eddy and stretches out to mid-channel – gently fading as it does. At LW you can see the rock that forms the wave beneath your bow. On neaps it is a gentle, fairly flat green wave. 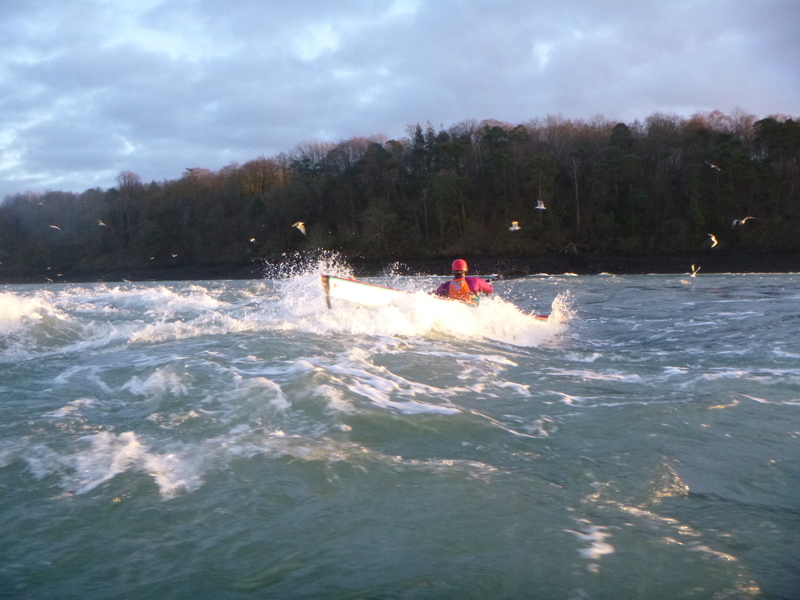 As the flow increases the wave gets steeper and larger and will start to break on the RHS (Anglesey side). This forms enough of a hole to give regular sport to the playboats and can provide a challenge for the sea kayaker crossing back to the eddy. 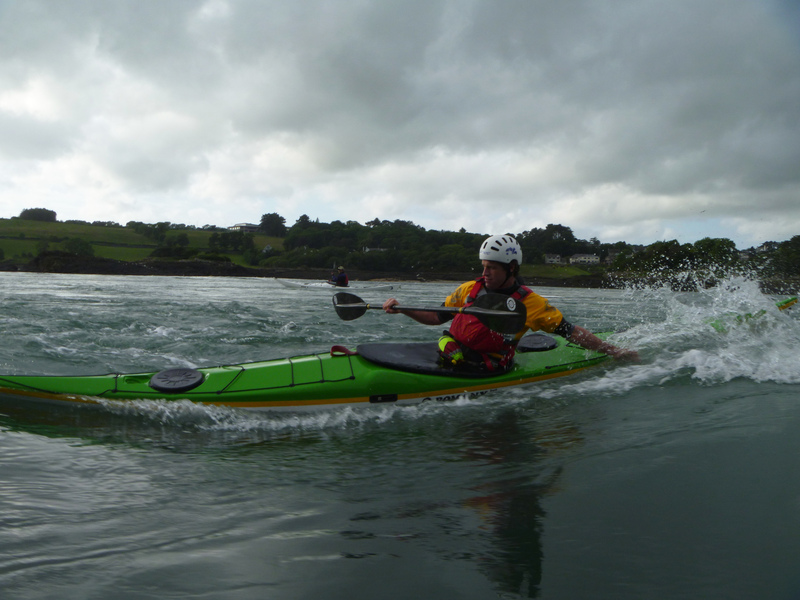 For a sea kayak it is a fast and steep, dynamic surf on the RHS – tapering into a decreasing, and less strenuous, green wave as you move further out. Immediately behind the wave in mid-channel there forms a powerful, dumpy boil which can be awkward and a little intimidating on bigger tides. This is passable either side however. As the wave becomes larger the RHS becomes an active surf, needing constant input and trim; while out in the middle, it is always smooth and relaxed – though just above the boil. On the faster flow of the large springs, the channel forms a rapid from the below the Cardinal down. A variety of smallish surfable waves form, though the Swelly Wave is always the largest. A rock just above the waterline on the Bangor shore gives a useful reference point for the main wave, if you are not sure which is the one. 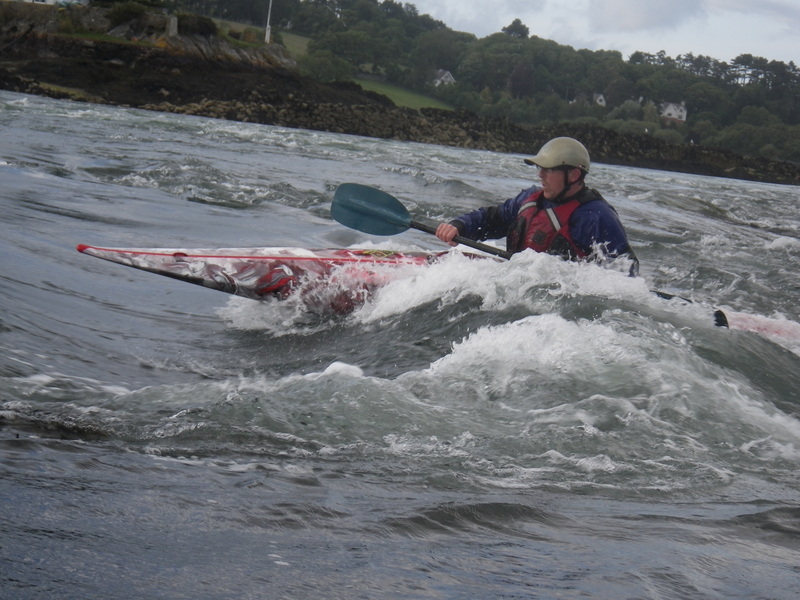 In a sea kayak the eddies on the Bangor shore are a viable option also. This wave washes out before the Swelly Rock wave comes online. If you are prepared to wait for a little while you can do both in one session. Runs from: On the flood from close before LW. Washes out before early mid-tide. Good For: A smooth fast surf and more dynamic moves in a short boat. Bad For: The boily dump below. It can also get busy in the summer months. I like… it for a summer’s night social. NOTE: Be aware that at LW this channel is the only viable option for craft to transit the Swellies. Sat in the trough of the wave you are barely visible from downstream and fast craft do transit through. Keep an eye out, and if you are still there at dusk or dark you should be showing a light. Location: In the channel between Swelly Rock and Ynys Benlas. On the immediate upstream of the hidden North Platters; roughly level with the downstream end of Ynys Benlas. Description: An almost completely flat cushion, hovering immediately above the small drop onto the platters. Each side of the cushion drops away and feeds quickly outwards. However it is surfable if you position centrally and accurately. 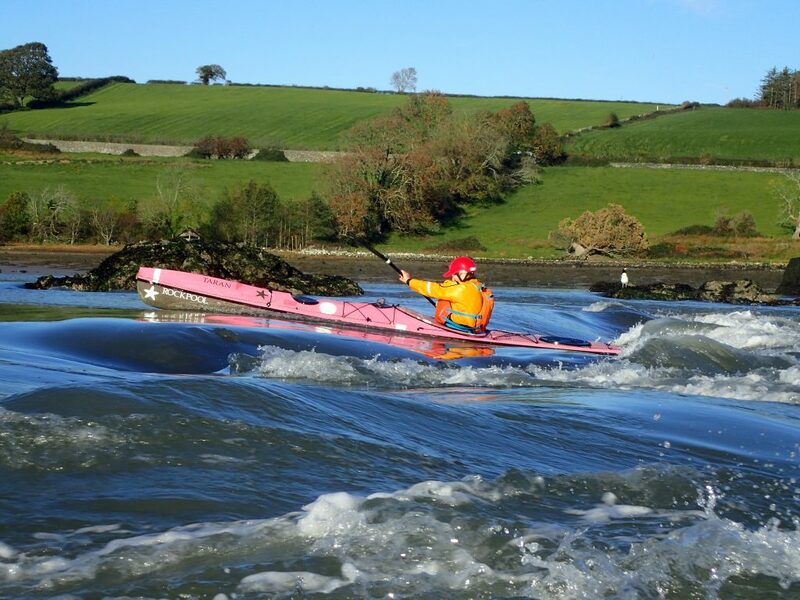 This requires precision paddling and good awareness to hold position – a useful training exercise. Don’t drop over onto the platters early on though, you may scratch something. Runs from: On the flood close after LW. Similar timings to Swelly Wave. Requires Spring tides. Good For: A challenging test of precision, awareness and micro-transits. Bad For: Like all cushions, placed in an awkward, potentially damaging position. I like… it for a precision test. Location: In the channel between Swelly Rock and Ynys Benlas. On the Bangor end of the drop caused by the hidden North Platters; immediate below on the Bangor side of the Platters Cushion. Description: As the water falls away from the cushion, there is a small green , slightly curved wave on the Bangor side of the feature, caused by the drop. This is a fast, smooth though small wave, but it needs a little planning to get there. There is no eddy here: you need to ferry from the Benlas eddy, going above (and around the end of) the cushion, or alternatively you can come from the large eddy below Swelly Rock. It is a relatively easy surf once you are on, but unforgiving if concentration slips – you’ve got to go around again! Close after LW on bigger springs it forms into a slightly staggered wave across much of the width of the cushion Get it right and this can be used to feed onto Boily Wave – a bit of a challenge but do-able. The Platters Wave can come and go a bit during the tide. Runs from: On the flood close after LW. Similar timings to Boily Wave. Requires Larger Spring tides. Good For: Paddling with a little thought and good awareness. Location: In the channel between Swelly Rock and Ynys Benlas, upstream of Boily Wave (see below). Description: A set of 2 or 3 small 2ft waves that run across the channel, in a slightly staggered manner. Positioned out from Ynys Benlas towards the upstream edge of the N. Platters. They run on the flood around LW but don’t last long. A big spring is needed to make anything that is reliably surfable and it demands decent ferry glide skills to make the required precision crossing across fast flow. 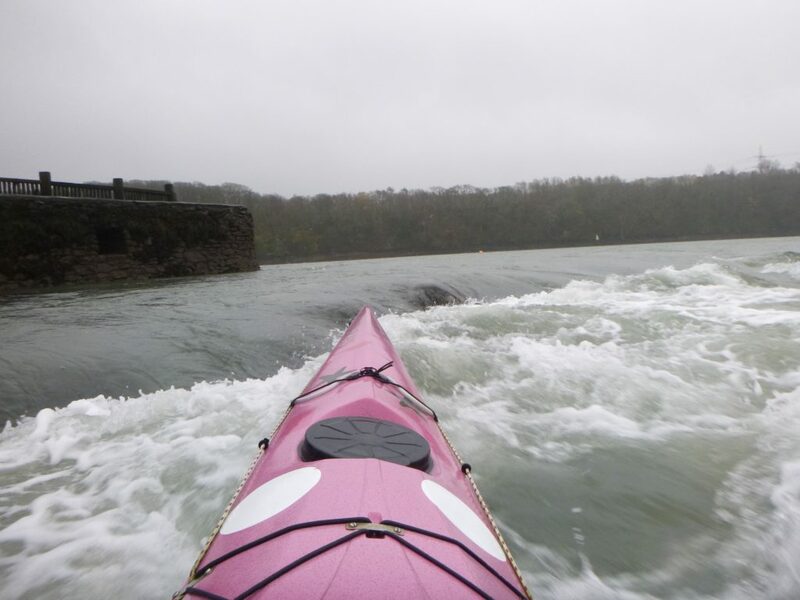 Use the eddy close on the S side of Ynys Benlas to gain height, and then it’s a fast ferry glide to catch the top wave. Take what comes after that. Don’t miss, it’s a longish slog to go around for a second go. Runs from: On the flood close after LW. Requires Spring tides. Good For: To make you think a little. Bad For: Comes and goes quickly, can be a little hit and miss. I like… it for the challenge of getting across and then on. Location: In the channel between Swelly Rock and Ynys Benlas, slightly downstream of Ynys Benlas. Description: A fairly narrow, steep wave with a slight horseshoe formed in a hollow. It sits well out in the flow. This is a fast, dynamic wave that needs pretty much constant inputs. At lower levels it is a fairly steady surf but the narrow width and water speed means any mistakes usually involve a trip back to the eddy. As the flow rate increases, the wave lifts, steepens and increases in speed. Constant inputs become the norm. Chains of vigorous boils drop down through the wave at times, providing sport and demanding quick reactions. At highest flows there is a wave just behind, though this is narrow and comes and goes a little. 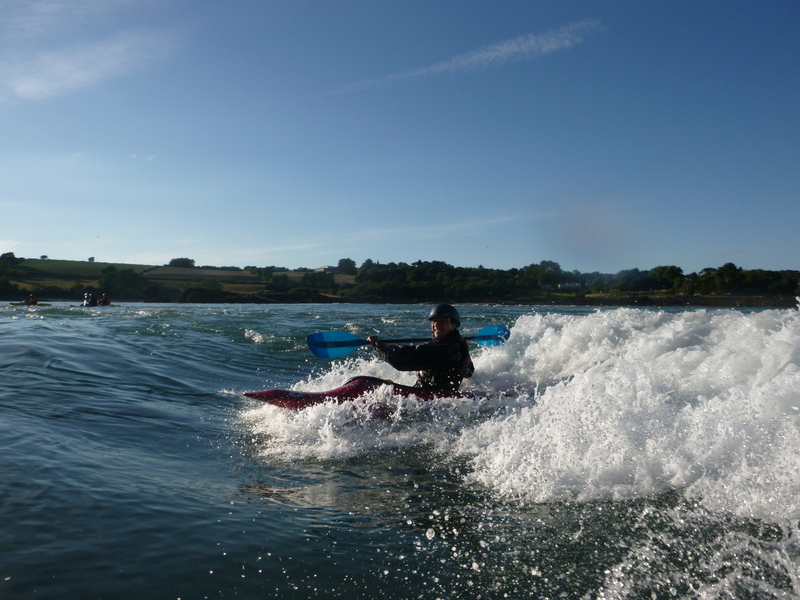 The slight horseshoe nature of boily wave means that it feeds unforgivingly on both edges. This wave almost feels alive. As the surge starts to come through it seems to throw more and more at you in order to kick you off – laughing at you as you go! Runs from: On the flood from LW to early mid-tide, better on larger springs. Good For: A challenging test of precision, handling and reactions. Bad For: It always wins. I like… it for an ‘it-won’t-be-long-until-you-lose’ challenge. Location: N side of the Swellies, between Ynys Welltog and Ynys Benlas. Description: A rocky reef that joins the small island of Ynys Benlas with the larger Ynys Welltog. The reef is dry at LW but then covers to give a small rapid with a collection of channels and small waves that vary throughout the tide. Arrive too early and it is just a rocky trickle, but as the tide lifts a small wave forms on the Bangor side. This varies constantly with the tide: it can be shallow early on, forms a white wave at times and later into a small green wave. It is an ok surf, but can be a bit clumsy due to the flow angle which is squeezed around the island. You can find yourself trying to hold the boat while bow and stern are in different flows sometime. At low-level there are paddle breaking rocks in here. Further across, towards the centre of the rapid, a small, slightly broken 1-1 ½ ft wave forms as the narrow centre gaps wash out. 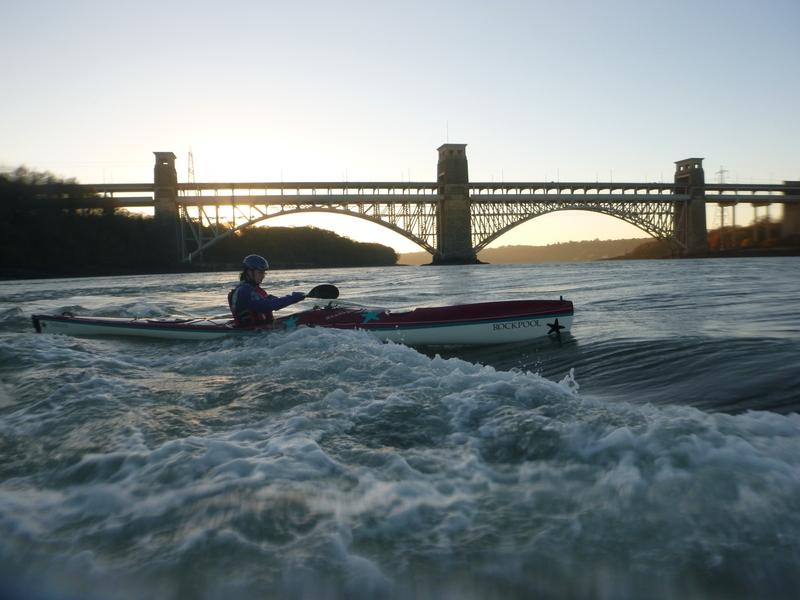 Nothing much happens on the Anglesey side, though a couple of eddies means that this channel can be used to climb back up the rapid fairly easily. 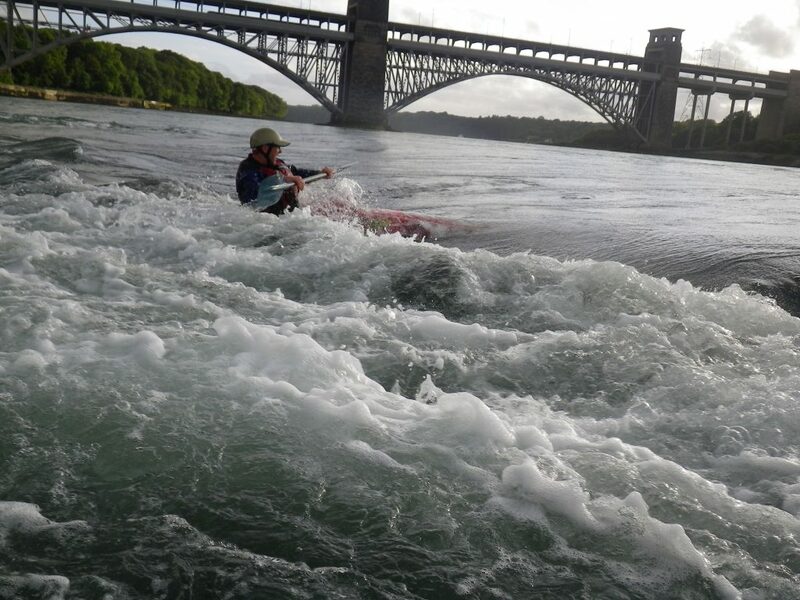 Snowdonia Rapid is a useful spot for practicing various white-water skills, but it is soon outgrown if you are looking to surf. Note: Going into the last 1/3rd of a large spring tide you may find the surge can stack up a fast 2ft+ wave across from the LHS to the centre of the rapid, this is quite rare however and depends on wind and barometric pressure. Runs from: On the flood after LW – washes out towards mid-flood. Good For: Easy WW skills – ferry glides, small surfs, climbs, crosses etc. Bad For: Rocky and you can quickly ‘out grow’ things. I like… it for a good moving-water training venue.